In the journal Cancer Research, UNC Lineberger’s William Y. Kim, MD, Benjamin G. Vincent, MD, and colleagues reported they have developed a mouse model of luminal bladder cancer, one of the two subtypes of advanced bladder cancer. The researchers said this model may help them to determine which patients may respond to immunotherapy treatments called checkpoint inhibitors. UNC Lineberger’s William Y. Kim, MD, and Benjamin Vincent, MD, developed a model for the luminal subtype of bladder cancer. Understanding that not all bladder cancers are the same, researchers at the University of North Carolina Lineberger Comprehensive Cancer Center have created a tool that may help them to uncover why only a fraction of patients respond to new immune-based treatments. 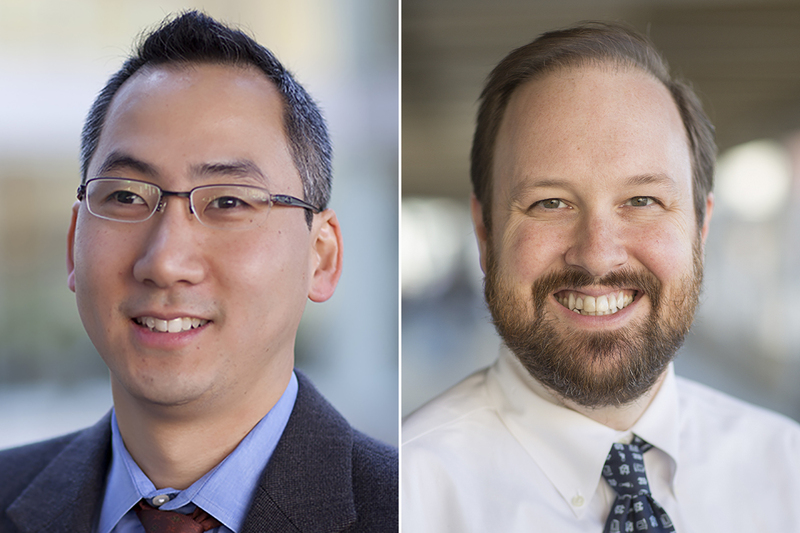 In the journal Cancer Research, UNC Lineberger’s William Y. Kim, MD, Benjamin G. Vincent, MD, and colleagues report they have developed a mouse model of luminal bladder cancer, one of the two subtypes of advanced bladder cancer. The researchers said this model may help them to determine which patients may respond to checkpoint inhibitors, a class of immunotherapy drugs that “remove the brakes” that can keep the immune system from attacking cancer cells. Five checkpoint inhibitors have been approved for metastatic, or locally advanced, bladder cancer since May 2016, giving patients additional options after standard therapy failed. But studies have shown that less than a quarter of patients will respond to these drugs. The researchers used their newly created model and an existing model for basal-like bladder cancer, the other subtype of bladder cancer, to examine features that may determine the effectiveness of checkpoint inhibitors. They studied the immune microenvironment – the immune cells in and around the tumor — for each subtype. They determined there was lower levels of immune cells in and around luminal tumors, and that this model did not respond as well to PD-1 inhibitors. They also analyzed the level of neo-antigens present on the two different bladder cancer subtypes. Neoantigens are proteins that sprout on the surface of cancer tumors as a result of DNA mutations or other alternations in cancer cells. Scientists are interested in using neoantigens to predict response to immunotherapy treatments, or as drug targets. Vincent’s lab used genetic sequencing to predict which abnormal proteins would appear on the surface of the cancer models, and then studied the extent to which the abnormal markers triggered the immune system. They found the luminal subtype had a lower number of markers that were highly immunogenic, or had the ability to trigger the immune system. “Understanding how and why tumors are differentially immunogenic is critical for understanding how to best use therapies that target the immune system in the clinic,” Vincent said. Kim said a future line of research will investigate how neo-antigens help to elicit an immune response, and whether they can leverage their findings to augment the activity of checkpoint inhibitors. “The models will allow us to mechanistically understand why certain neo-antigens will cooperate with checkpoint inhibitors, and why others don’t,” Kim said. Overall, he said the work could help to clarify the best approach for treating patients after their disease has progressed on the standard of care. It also provides a laboratory tool that accounts for bladder cancer being a disease with distinct subtypes. In addition to Kim and Vincent, the study’s other authors include Ryoichi Saito, Christof C. Smith, Takanobu Utsumi, Lisa M. Bixby, Jordan Kardos, Sara E. Wobker, Kyle G. Stewart, Shengjie Chai, Ujjawal Manocha, Kevin M. Byrd, Jeffrey S. Damrauer, and Scott E. Williams. The research was supported by the Bladder Cancer Advocacy Network Innovation Award and Young Investigator Award, the University Cancer Research Fund, the National Institutes of Health, and the UNC Oncology Clinical Translational Research Training Program.